For his latest book, SIS Professor Philip Brenner drew on extensive research and many trips to Cuba. Credit: iStock. For such a small island, Cuba has occupied an inordinately large space in the public imagination. With its proximity and perceived hostility, Cuba became a Cold War hotspot and US foreign policy obsession. Yet the Cuban perspective is often, surprisingly, lost in any discussion about Cuban interests. 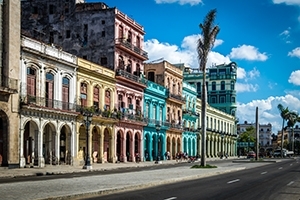 Philip Brenner, an American University School of International Service professor, attempts to rectify that in a recent book, Cuba Libre: A 500-Year Quest for Independence. The book-coauthored with veteran journalist Peter Eisner-is an examination of Cuba's history, identity, and motivations. In understanding how Cubans think and feel, Brenner believes there are lessons for the United States. "I think a successful US foreign policy is done empathetically. Empathy is not sympathy. Empathy is putting yourself in the other person's shoes, and most importantly, then seeing yourself as the other sees you," says Brenner in an interview. In researching Cuba, Brenner found a persistent desire for independence and sovereignty. On the back of the Cuba Libre book, there's a picture of a trogon-Cuba's national bird. Its feathers are the colors of Cuba's flag, but Brenner notes an added significance. "This is a bird that refuses to be caged. If it's caged, it dies. And put into captivity, it demands to be free," says Brenner, also an AU affiliate professor of history. Given Cuba's history of resisting imperialism, the book begins with the arrival of Columbus in 1492. The Cuban revolution, as Cubans see it, dates to 1868 and the 10-year war against Spanish colonizers. Spain eventually implemented a few reforms, and some Cuban rebels agreed to a compromise, Brenner says. But Antonio Maceo refused to stop fighting, since the new pact lacked decolonization or the abolition of slavery. He issued the "Protest of Baraguá," a rallying cry that Cuban leaders still cite today. There's a contrast in perspectives when reviewing the Spanish-American War in 1898. Cubans don't even call it the "Spanish-American War," but the "War of Independence." "It's as if we call the American Revolution the 'Franco-British War,' since France supported the US," he says. "It's an insult." Although the US purportedly entered the war to expel Spain and help the Cubans, Brenner says American intentions were much less noble. "We were worried that the Cubans, who were about to win their independence from Spain, would hurt US property," he explains. "We had sent the USS Maine there to let the rebels know that we were looking after our property. And, of course, the explosion of the Maine is what prompted us to ultimately get into the war." Cuba wasn't even allowed to attend the peace treaty signing between the US and Spain. Against that backdrop, it's no wonder Cuba felt it was treated like colony, Brenner says. "Ever since that war, we thought of Cuba as our 'Pearl of the Antilles,' in some ways the way Britain thought of India as its 'Jewel in the Crown.'" The revolutionaries who overthrew the Fulgencio Batista regime in 1959 were determined to prevent the United States from snatching victory from Cuban hands again. From the US perspective, this made Cuba an enemy, and the worst US fears were realized when the Soviet Union placed nuclear missiles there in 1962. Yet the US and Cuba remember the Cuban Missile Crisis quite differently. While the US clings to the fabled "13 Days," used for the title of Bobby Kennedy's memoir, Cuba dates the crisis to the CIA-supported Bay of Pigs Invasion and the ensuing "Operation Mongoose" covert mission to overthrow the Cuban government. Brenner explains why the Soviet missile deployment itself was misunderstood. "Cubans felt they needed a way to defend themselves. They asked the Soviets for support, and what the Soviets offered them were missiles. They did not want missiles. What they wanted was a promise that the Soviets would help defend them," he notes. Cuba soon believed the Soviet Union betrayed them as well. Feeling under siege, Fidel Castro cracked down on internal security. Brenner and Eisner don't shy away from detailing the serious human rights violations in the 1960s, but they do put them in context. "The violations were terrible. I can't justify it, but I can understand it. They felt totally isolated and alone. And they started to export revolution, because they had to find allies in the Third World," he says, which led to increased tensions with the US. Throughout his lengthy reign, Castro attempted to project national strength through multiple avenues, from world-class health care to competitive sports. "I think that what Fidel Castro wanted to give Cubans was a sense of dignity," he says. Yet he was unable to build a younger generation that could sustain any progress. "Ultimately, he didn't succeed, but he did give people a sense of being Cuban." Brenner first traveled to Cuba in 1974, and in the book, he draws on some four decades of trips and research. Cuba Libre includes interviews with government officials and people on the street. There will be a major book presentation in Cuba in December, and he's also scheduled to talk at the Guadalajara International Book Fair in Mexico. Along with improving diplomacy toward Cuba, he believes the book is pertinent to how the US conducts foreign policy around the world. "Little countries that care about their sovereignty are going to find ways to defend themselves. They'll do this in ways that we may not be able to imagine, and in ways that will cause us much more trouble than if we tried to talk to them," he says. "We have to understand their history, and their history with us."